There is so much information out there on what your kids are supposed to be eating. Eat this, not that! And NEVER those! It can be so confusing sometimes. The best is when Grandma calls and starts giving her best advice on what she wants her grandkids to eat. Do you ever think, "Umm, I'm not so sure about that. Let me ask someone who knows (no offense mom)." This happens to us all the time, and while we at Little Global Chefs have a pretty good idea about what our kids should be eating, sometimes it's best to find out the real deal from someone who knows what they're talking about. We sat down with Nicole Silber RD, a registered dietician and pediatric nutritionist in New York City to get the 411 on kids' diets. She gives us straight up and honest answers to many of the questions we have been wondering about for a while now. There's some fascinating and surprising info here, so we'll be providing this interview in two installments: one this week and one next. But if you can't wait that long and want to see the full interview, check it out on our blog now. Must. Get. More. Protein... How do I get my kids to eat more protein? They're not getting enough, right? This is the most common concern I hear from parents and it stems from the idea that there's so much emphasis amongst adults on upping lean protein in their own diets. But for kids, there tends to be a gross over-estimation of how much protein a child actually needs. 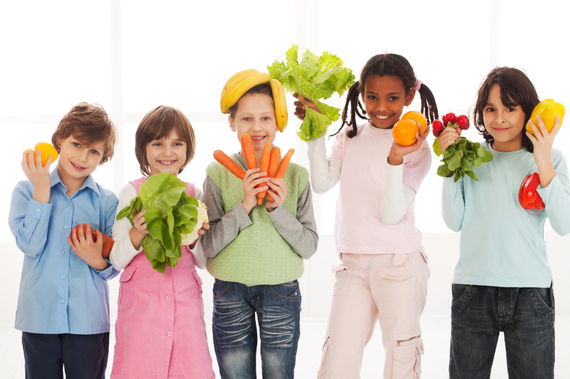 Every kid is different, but an an average child from ages 1-9 needs 13-19 grams of protein per day. That's not really a lot! To give you an idea, one egg has about 6 grams of protein, one glass of milk has 8 grams and ½ a chicken breast has 25 grams - so it really adds up quickly! Animal proteins and dairy are best in that they are considered to be complete proteins and are very absorbable. Quinoa, by the way,is one of the few plant based proteins considered a complete protein. Most plant based proteins (beans and legumes) are less absorbable, so you need more of it. But if you combine these with other foods like "rice and beans" the combination makes them complete proteins and extremely absorbable. Are frozen foods that bad? I'm too tired to cook. Is it OK if my kid eats frozen chicken nuggets for dinner?? They're organic!! My biggest concern with frozen, prepared meals, besides the high starch, fat and salt content, is that they are highly processed and often have very dull flavors. This just propels a cycle of picky eating as kids don't get exposed to real rich flavors and they get used to bland and unfresh meals. It's fine to keep a small stock of frozen, prepared meals but I would not use them for regular meals. And if you're going to serve prepared meals, it's ideal for them to be organic - particularly things like chicken to limit the antibiotic exposure. Rather than relying on the pre-prepared meals, whenever you can cook, double the recipe to then freeze and store those homemade dishes, like soups and chicken in the freezer. And I will say that pre-cut frozen veggies are great to keep and use frequently because those are still healthy and quick! The microwave. Is it bionically mutating my food? The microwave is not the most ideal cooking device. It definitely leaches out some nutrients from food, but it doesn't leave the food completely barren of nutrition! It won't deplete your food of its fiber, protein and most minerals, but it will kill water soluble vitamins and antioxidants. But I still think it's better to use it if it's going to going to help you put out a meal when in a bind or to warm up leftovers so that you can spend an extra five minutes to chop up a fresh salad! I wouldn't rely on it for everyday use. The toaster oven is a great alternative since it's so quick. What's the worst thing you have been seeing in kids' diets these days? Hmm, in my practice I find most people have a general idea about nutrition - meaning I am not seeing fast food and cheese burgers regularly. But,what I am seeing a lot of, that may seem benign to many parents, yet is really interfering with good eating, is frequent snacking, or grazing on non-nutritious foods. That is when the handfuls of Goldfish, bags of pretzels, granola bars and dried cereal come in. While they may not have any egregiously bad ingredients, they are essentially empty calories that are being eaten as regular and far too frequent snacks. Snacks should be nourishing, and not only are these foods not providing the needed nutrition, but they are filling kids up which really takes away from their appetite for nutritious foods at meals. Rather than munching on handfuls all afternoon, kids should be on a routine pattern of 3 meals and 2-3 nutritious snacks a day. If you could pick three things you think kids should eat more of - what would those three things be? Fish - Gotta get in those omegas! It is a strong flavor so the earlier it is introduced the more likely it will be accepted. Beans & legumes - These are great sources of plant based proteins and fiber, which often kids don't eat enough of. Fresh, unprocessed foods that don't come in boxes. We have even more great information from Nicole coming your way. If you want to read more about if it's possible to eat too much fruit (WHAT? ), if boys should eat soy (OH MY! ), or whether you should get rid of all the foil in your house (NO WAY! ), check out our full interview on our site or tune in here next week for Part II.